With about 100 million iPads sold since the ground-breaking tablet launched in April 2010, chances are you either have one or at least know someone who does. If you’re the proud owner of an iPad, are you using it to its full potential? Possibly not, if the results of a 2012 Business Insider survey are any indication. The survey of 2,242 iPad users found that the majority are using their tablets in very traditional ways, from Web browsing (37.3 percent) and communicating via email and social media (21.4 percent), to watching video (12.3 percent) and playing games (11 percent). Yet with a little creativity – and the right accessories – it’s possible to find uses for your iPad in virtually every room of your home. Recipe websites abound, but when you want to try a new recipe do you find yourself printing it out and then juggling the paper while trying to cook? And if you like the recipe, what are the chances that you’ll misplace that printout before you cook the dish again? Your iPad can help solve the problem. Get yourself an iPad Mount for magnetic surfaces (Sanus makes the VTM7 for this purpose), mount your iPad on the side of the refrigerator closest to your cooking area, or on any other convenient metal surface, and you’ll never have to deal with printed recipes again. The mount is designed to work with the Apple Smart Cover and is compatible with the iPad 2, and the third and fourth generation iPad. Millions of Americans now work from home, and many with traditional office jobs also do some work at home. A second monitor can make work tasks easier, but fitting two, full-sized monitors on the average home office desk can be a challenge. You can use your iPad as a second monitor for your laptop or desktop computer with the help of apps designed for this purpose. These apps use your iPad’s Wi-Fi capabilities to share a video signal with your tablet. Make it even easier with a VTM1 iPad Mount designed to hold your iPad upright on a desk. Have you ever had to wait for a table at your favorite restaurant, and asked to look at the menu while you wait? What if they’re so busy they don’t have a menu to spare? 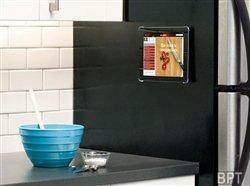 Whip out your iPad (who doesn’t carry it with them everywhere? ), access the restaurant’s website and peruse the menu online. By previewing the menu on your iPad, you can be ready to order as soon as you sit down. Some leading-edge restaurants have even begun using iPads for menus, complete with interactive apps that help you choose dishes and even indicate how you’d like your steak cooked. From the flat screen HDTV and blu-ray player to the surround sound and home automation systems, your home is probably full of remote controls. How many times have you wanted to turn off the TV and grabbed the wrong remote? Or couldn’t find the remote that would allow you to set your home security system? With the right app and accessories, your iPad can simplify your home technology by replacing many (if not all) of those remotes. Many major cable and satellite providers offer free apps for this purpose. It seems likely the iPad is here to stay. The Business Insider survey found that nearly half of all respondents (46.7 percent) now use their iPads as their primary computer. With the technology getting better all the time, iPad devotees will continue to find more creative uses for this groundbreaking tablet.